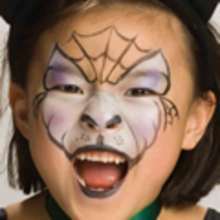 face painting colors: turquoise, purple, black and silver gel. Using a sponge, apply a layer of turquoise color all over your face as a base. With your brush, paint purple over the entire eyelid and eyebrow finishing in a point at the temple. Apply the same color in a line under the eye sweeping down to a point at the top of the cheekbone. Paint your lips in the same shade. Using black color, create thick, bushy eyebrows by painting thick lines along the upper edge of the purple shape around the eyes. Add black strokes at the outside corner of the eyes. Get creative by adding a moon, stars, a beauty spot and even a cat, to complete the effect. Finally, add some sparkle to the black areas by using silver glitter gel. You are a lovely green halloween witch now! Go for sweets! 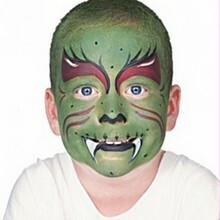 Snazaroo is a professional face and body paint. Professional and cosmetic quality. A quality product easy-on with sponges and brushes. Easy-off with soap and water.